Alltel launches BlackBerry Curve 8530 | BlackBerry Blast! 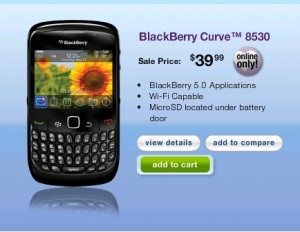 Alltel is now offering the BlackBerry Curve 8530. We've seen Sprint, Verizon, and Telus recently launch this same BlackBerry 8530 but their contract terms are longer. Alltel is offering the BB 8530 for $39.99 after a $360 online discount and $100 mail-in rebate. The price for the phone without discounts is $499. If you're on Sprint or Verizon you may want to wait for the BlackBerry Tour 2 to make its appearance as it has a little better specs. If price is a concern, then the Curve 8530 is the way to go.